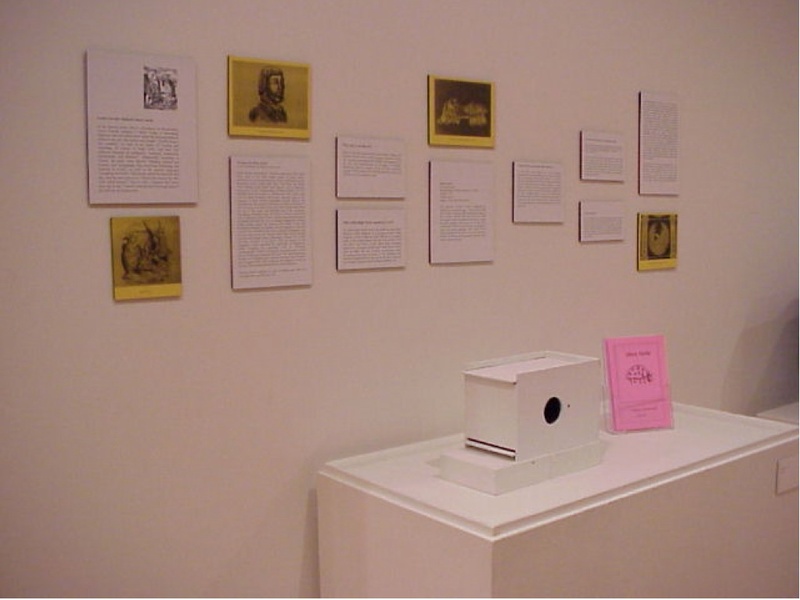 Mock Turtle is an installation that experimented with the conventions of label and other educational interpretive writings in museums. A white box with a hole in a gallery contains what is supposed to be a Mock Turtle and many labels provide all sorts of contradictory information about what is being presented. The viewer is confronted with the conflicting information about an object that can’t be seen. The piece was a reference to an episode of Antoine de Saint Exupery’s The Little Prince, where the prince asks to the main character to draw a lamb for him. After many unsuccessful attempts, he draws a box with holes in it, saying ” your lamb is inside”, leaving the prince satisfied. 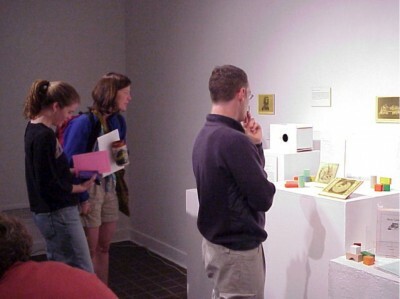 The piece was exhibited at the Center for Book arts in Columbia College, Chicago, The University of Oregon in Eugene, and at the Pittsburgh Center for the Arts, all in 2001. The Mock Turtle (Tortolis Falsus), as it is referred to by various fiction writers, is an almost forgotten specimen of the reptile family, belonging to the Chelonia order. It has an armor-like shell and strong, beaked, toothless jaws, plus a noticeable protruding nose and pig-like ears that often differentiate it from regular turtles. Due to a profuse excretion through their eyes, mock turtles often are thought to be shedding tears, reason for which they were known as “crying turtles” in antiquity. Mock turtles were found usually in most of the temperate and tropical world, although nowadays are considered nearly or completely extinct. The land-living species are commonly called MOCK TORTOISES; the mock terrapin is generally applied to fresh water or backish water species . Mock turtles range in length from a few inches to over 20 feet. Many specimens have been reported to live over 100 years in captivity and have a life span of 350 to 450 years. The 200 or 300 species of mock turtles are classified in 12 families. The largest family of the Northern Hemisphere is the family of the common freshwater mock turtles (Emydidae Falsiae). Turtles are the oldest living group of reptiles , dating back to the time of the earliest dinosaurs. Mock turtles, on the other hand, differentiate from their immediate relatives -the regular turtle family- by the fact that they live almost twice as long (some are known to have lived 500 years) and that their brain is by far the most developed to any other member of the reptiles, with a learning ability which is comparable to the dolphins and a memory which is similar to the one of the African elephant. Why is this Mock Turtle considered “Art”? This piece, titled Mock Turtle, was created by artist Pablo Helguera. Pablo Helguera is a conceptual artist. Pablo Helguera is also a Mexican artist (Mexico is a country south of the United States). He also lives in New York City (New York City is a city where many conceptual artists live). Conceptual artists make works that are based more on ideas, and not so much on physical works. According to the artist, this piece is “art”, because it was submitted intentionally by him for an art show. Why can’t I see the art? Mock Turtle are considered shy and sensitive beings and therefore should not be overly exposed to humans, as they may become overly depressed, irritable and dangerous. At any rate, most contemporary art nowadays is invisible, immaterial, and as a matter of fact, not that interesting visually. For that reason, the artist has decided to spare you with the need of seeing this work. This specimen of Mock Turtle is displayed in (almost) its conceptual stages. Mock Turtles often take 3 years to develop after being laid as eggs by their mother. Shortly after they are born, their development starts very quickly, and within a month they have reached a size of one or two feet. (The confinement in this box of this turtle is intended to delay such quick expansion). Most Mock Turtles tend to measure 20 feet and live for up to 400 years. Turtles are the last surviving species that date back from the dinosaur period. In his famous book, Alice’s Adventures in Wonderland, Lewis Carroll includes a Mock Turtle, a fascinating character who lets Alice know about the learning habits of turtles in the sea. The turtles were taught “French, music, and washing”, as well as the basics of “reeling and whrithing, of course, to begin with”, and then “the different branches of Arithmetic: Ambition, Distraction, Uglification, and Derision”. Additionally, according to Carroll, the mock turtle learned “Mystery, ancient and modern, with Seaography, then Drawling, Stretching, and Fainting in Coils”, as well as the ancient languages “Laughing and Grief”. The classes lasted ten hours the first day, nine the next and so on. “That is the reason why they were called lessons”- Alice is told – “because they lessen from day to day.” Carroll certainly had a thorough grasp of the difficult art of education. Artists often feel like turtles, being rejected, uneasy to feel green, always slow in their careers and out of synch with the rest of the world. However, the good part is that, like the turtles, artists use their artwork like a shell to protect themselves from the harshness or real life, and by doing so, manage to survive very successfully in our demanding contemporary world. Could my four-year old have done this piece? As this piece really consists in a series of written explanations about what the piece is, it would be unlikely that your four-year old would be able to write them. However, the creator of this work has often acknowledged that most of his ideas for his artworks originated – and also ended – when he was between 4 and 6 years old, and that it took him 23 years to achieve the necessary credibility to be able to display such a piece in an authoritative environment such as this one and afford the opportunity of calling this “art”. And, ultimately, there is large consensus by art experts that most visual artists tend to write like four year-olds. All art is political. Even when an artist doesn’t want to make political art, that in itself becomes a political statement – as it was famously argued by George Orwell in an essay. Given that premise, the author of this piece chose a random topic of his own liking, with the certainty that it will become a strong political statement regardless. Nothing more political symbolically than a mock turtle: it is enough to remember Orwell’s own Animal Farm as an example. Mock turtles are a powerful sexual metaphor. The symbolical implication of a mock turtle in a gallery arises notions of fakeness (impotency), slow motion ( lack of sexual agility ), and pre-pubescence (being green). Without a doubt, the use of such an animal in an art piece invites the viewer to reflect on his/her/its own sexuality. Dutch explorer and scientist, Sebastian Hapstrung (1740- 1826) wrote some of the most notable works on mock turtles, particularly on one he encountered in 1768, in the French Guyana. Hapstrung wrote a work titled Essay Concerning the Human Understanding of the Mock Turtle Species, and its Important Implications in the Understanding of Human History. 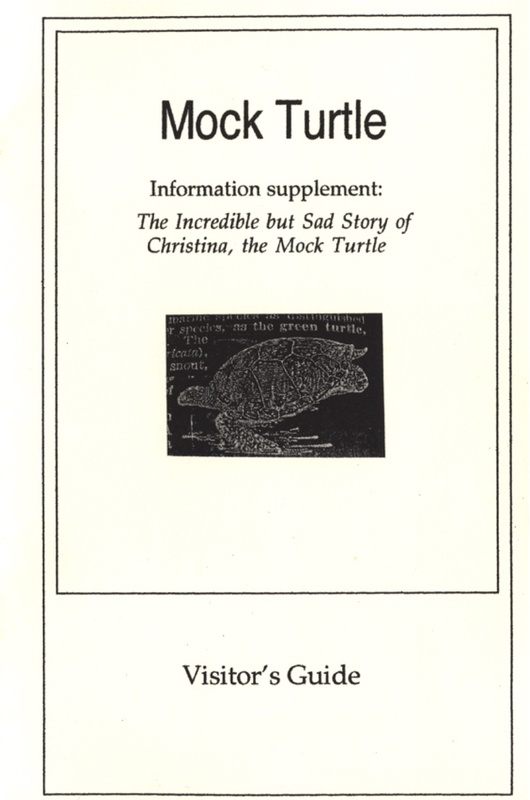 In it, he described how he was able to communicate with a mock turtle (who he named Christina) after doing a thorough study on the language of these reptiles. Hapstrung claimed that he had transcribed the life history of Christina as it had been dictated to him. This story went back to the early 1500’s (most mock turtles live up to 500 years, and Christina wasn’t the exception). 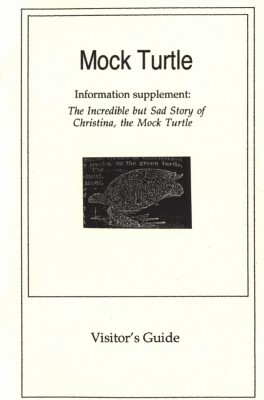 Hapstrung’s unfinished work, The history of America through the eyes of Christina, a Mock Turtle, revealed astonishing facts about the animal that to this day. In it, according to Hapstrung, Christina recalls having crossed the Amazon river inside a boat that belonged to Francisco de Orellana, the first Spaniard to cross the Amazon. The vividness of the scenes written by Hapstrung –who actually wasn’t much of a literary talent- have always puzzled even the most skeptic critics. Hapstrung’s writings were at first not taken seriously at all, but in 1817 the director of the Zoological society promoted the publication of Hapstrung’s works, including his unfinished work on Christina’s “autobiography”, written in a dramatic, almost epic style worth of the pen of the great historians. Ever since that time, Hapstrung’s theories have remained as an unsolved mystery in the zoological and biological fields. Such perplexity has managed to keep the mystery of the communication with the mock turtle alive. Christina lived in captivity in a zoo in Surinam until 1966. It is estimated that it was 498 years old.